It is a painful condition in which the digit clicks or locks as it is bent towards the palm. The hand has no muscles but tendons that bend the fingers or thumb into a palm pass through a tunnel made of thick fibrous tissue. In a trigger finger there is thickening of this tunnel, leading to roughness of the tendon surface or a lump in the tendon. The tendon fails to glide effectively and catches at the mouth of the tunnel causing clicking or locking. The ring finger is the most common to be affected, followed by the middle finger. Trigger thumb is as common as the middle finger. The majority of patients will present over the age of 40. There is no known cause that leads to the triggering. The condition is more common in females and is associated with conditions like diabetes, gout, De Quervain’s disease, amyloidosis and haemodialysis patients. It can occur in patients with rheumatoid arthritis. There is little evidence that it is caused by work activities, but the pain can certainly be aggravated by hand use at work, at home, in the garden or at sport. In children: Trigger digits (usually thumbs) can occur in children and usually present at around the age of 2. Though the condition is often referred to as ‘congenital’, trigger thumb is a misnomer, as it is not related to any hereditary or congenital disorder. The condition is not apparent at birth. Moreover the child usually presents with a bent (locked) thumb without triggering. In a third of cases in children, it can be present on both sides. 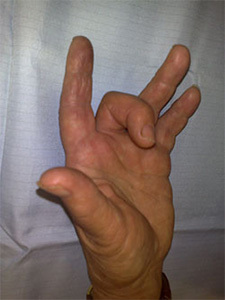 Patients with this condition will usually complain of clicking or popping of the finger from a bent position. This may be associated with pain at the site of triggering and the area will be painful if you press it. It is sometimes possible to feel the lump in the tendon at the base of the affected digit as one bends and straightens the finger. The lump moves as you move the finger. 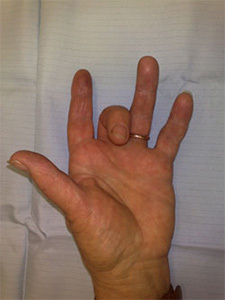 In more severe cases the finger or thumb will lock and may need to be straightened with pressure from the opposite hand (see picture above). Patients may also develop stiffness, especially in trigger thumb where movements at the end joints are reduced. The symptoms are usually worse in the morning. In children normally the parents notice that the child has a bent thumb and they are not able to straighten the thumb. In children the trigger digits may resolve by themselves but the chances decrease with increasing age. They usually require surgical treatment after the age of 3. The diagnosis of a trigger digit is made clinically and no special tests are necessary. Trigger fingers should be clinically differentiated from a locking swan neck deformity and a sagittal band rupture. Modify or avoid activities that cause pain or locking if possible. A splint can be fitted to hold the finger or thumb straight at night. This will keep the affected part of the tendon in the tunnel and make it smoother. A local steroid injection will relieve pain and triggering in a good proportion of patients. The success rate is lower in people with diabetes. If improvement after the injection is temporary, a second injection is sometimes helpful. However repeated injections give diminishing returns and surgery is needed if triggering persists. Surgeons may choose to avoid injecting a trigger thumb since the nerve that recognises sensations from the thumb cross the thumb and there is a possibility of the needle injuring the thumb. Surgery is indicated if the above treatments fail. The standard surgery is open surgical release of the tendon tunnel and is usually carried out under local anaesthesia as a day case procedure. At surgery, a tourniquet cuff is applied around the forearm so as to stop bleeding and make the operation safer and quicker. This tourniquet is needed for about 10 minutes and can be uncomfortable in a small number of patients. After the operation, a sticky dressing is applied over the surgical wound. A bulky supportive cotton-wool dressing is then applied. This supportive dressing is reduced after a couple of days. The small sticky dressing should be left on for 10 -12 days, when the stitches will need to come out. The arm should be kept elevated after surgery for 1-2 days as this will prevent the fingers from swelling and causing discomfort. Light use of the hand should be possible from the day of surgery. Active movements of the finger are recommended soon after surgery. Some surgeons advise percutaneous trigger finger release with a needle. In this technique the release of the tight mouth of the tunnel is carried out by using a needle inserted under a local anaesthetic injection. In my opinion open surgery is more effective and the percutaneous technique is not suitable for all cases and all digits. Some mild cases recover over a few weeks without treatment.Trigger finger and trigger thumb are not harmful, but can be painful and interfere with everyday activities. If not treated, secondary stiffness and contractures can result. In our experience most patients find that the symptoms are disabling to the point that they seek medical help. The operation is more than 95% successful. The surgical scar may appear reddish for 2-3 weeks and may be tender for 6-8 weeks. However it is seldom troublesome in the longer term. Infection of the wound is possible and can usually be successfully treated with antibiotics. If pain increases after surgery, infection needs to be ruled out. Recurrence of symptoms does rarely occur, especially in patients who have diabetes. Stiffness of the finger joints is possible and hence there is a need to exercise them soon after surgery. Damage to the digital nerve is possible, but very rare when the open surgical technique is used. Keep the wound dry. Once the stitches have been removed the scar can be massaged regularly with a soft non-perfumed cream for a couple of months. If the scar is tender to press, tapping along the scar and on either side firmly with your fingertips, a few times a day, may be useful. Also try to become used to putting pressure through your hand and wrist again. It is quite normal for this to feel uncomfortable at first. Return to work depends on many factors including the nature of the job and hand dominance. Generally patients can return to a desk job within a few days and perform reasonable tasks with the hand. Avoid pressing heavily on the scar. Manual work should be avoided for 3-4 weeks.